Kids love the holidays, but many don’t enjoy what comes next–writing all those Thank You cards! I look for ways to make it more fun more my kids, especially now that they can write their own. I expect them to write 2+ sentences for each card, which can take quite a while when there are many to be written. 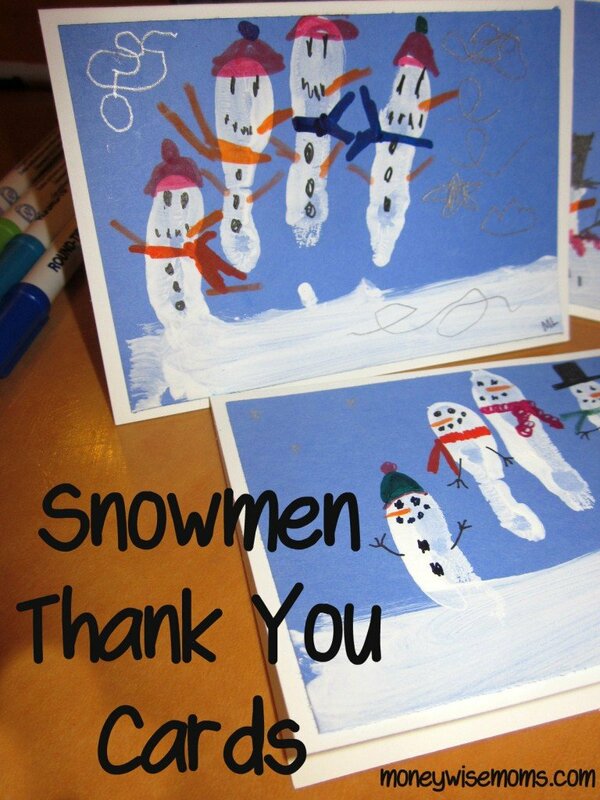 We made some quick Snowmen Thank You Cards to liven up our thank yous. This is an easy project you can do, too! Cardstock–I used both white and blue, but use whatever you have on hand. Construction paper would work well, too. I used colored cardstock so the white paint would stand out. Just paint your child’s fingers liberally, then press them down to make 4-5 “snowmen” shapes on the paper. While these dried, we wrote our thank you cards on the white cards, leaving the fronts blank. Once the paint was dry, decorate the snowmen with markers. 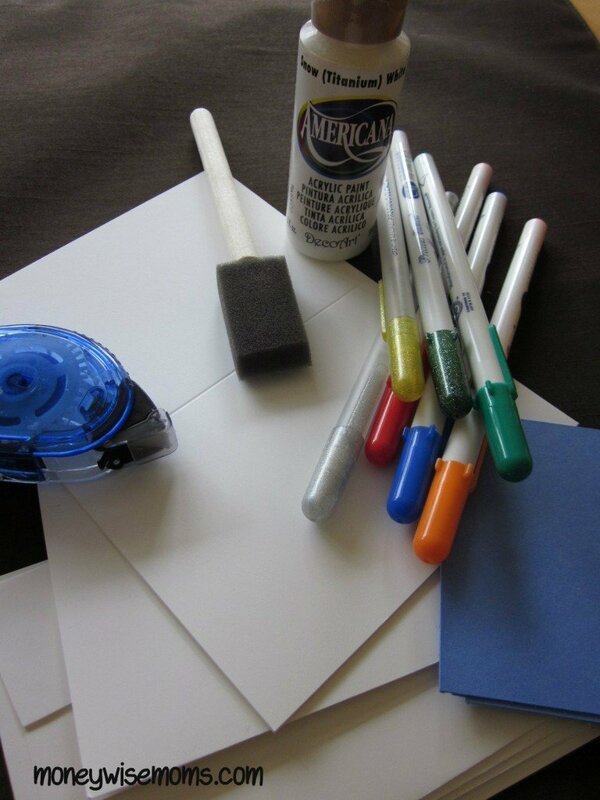 Glue or tape the colored cardstock to the front of the card. My girls were so pleased with their little snowmen, and it made the Thank You Card writing chore a lot more fun! 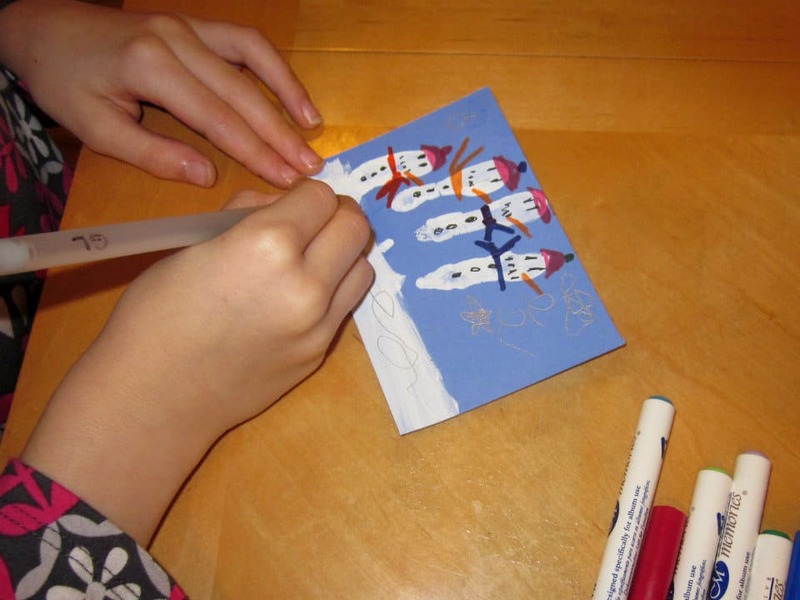 Snowmen Thank You Cards is linked up to Whatever Goes Wednesday at Someday Crafts and Whip it Up Wednesday at Naptime is My Time. These are so cute! What a fun idea. Thanks so much for linking up with Whip It Up Wednesday!